1. On your keyboard, press and hold the Windows key + R. This will open a new window near the bottom left of your screen called Run. 2. Inside this window, enter C:\programdata and click the “OK” button. *Your hard drive may be labeled differently than “C” – if that is the case, edit the string above with your appropriate hard drive name. 3. 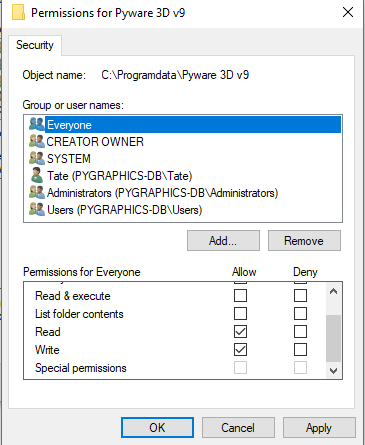 Look for the Pyware 3D V# folder, where # is the latest version for your Pyware 3D license. Once you have found the appropriate Pyware folder, open it. 4. Inside the Pyware folder, delete both the lib and temp folders. !If you are unable to get past this window, please consult with your IT personnel. 5. 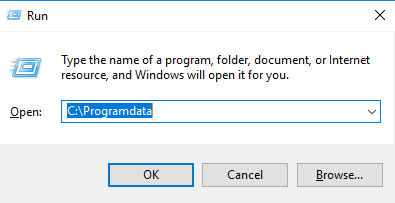 Click the back button once to return to the “ProgramData” folder. 6. 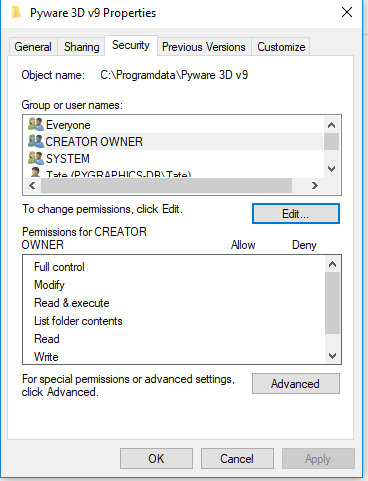 Right click on the Pyware V# folder inside of ProgramData and choose Properties. A new window will appear. 7. Click on the Security tab at the top of the Properties window. 8. Click the Edit… button, which will open a new window. 9. Click on the Add… button, which will open a new window. Type “everyone” inside the object name box, then click “OK”. 10. 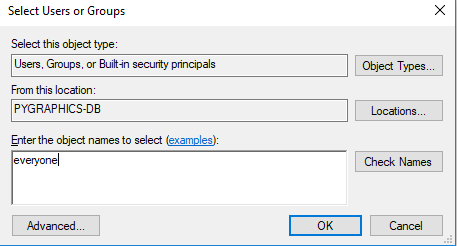 Back on the Security tab, select “everyone” under the Group or user names section. This will highlight “everyone” in the list. 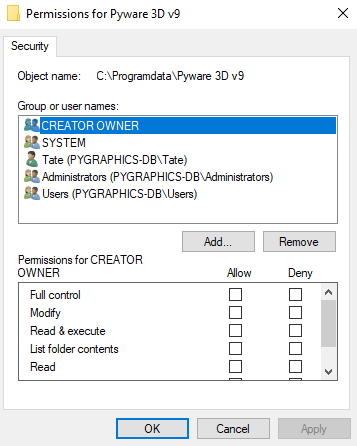 At the bottom of the window, under the “Permissions for Everyone” section, check the boxes for Read and Write under the Allow column. Press “OK”. 11. Back under the Properties window, click “OK”. 12. 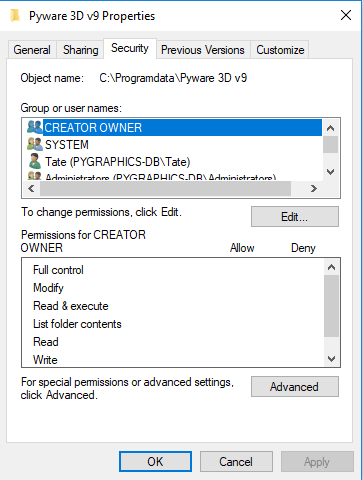 Launch Pyware 3D and activate the software one last time. From this point forward, all future runs should not prompt you to activate Pyware.